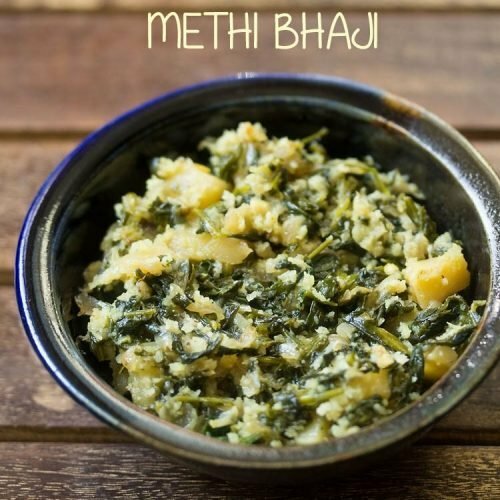 this methi ki bhaji recipe or methi sabzi is a simple, healthy and yet tasty recipe made with methi aka fenugreek leaves. rinse 3 cups methi leaves very well in water. drain all the water. then chop the methi leaves. also chop 1 medium onion, 1 medium potato, 1 green chili and 3 to 4 small to medium garlic. keep aside. chop the potatoes in small cubes so that they cook quickly. in a pan heat 2 tablespoons oil. once the oil becomes hot, add the chopped onions. saute onions till translucent. then add the chopped green chilies and garlic. mix well and saute for 3 to 4 seconds. next add 1 pinch of turmeric powder (haldi) and 1 pinch of asaofetida (hing). mix very well. add the chopped potatoes. mix and then begin to saute the potatoes for 2 to 3 minutes. then add the chopped methi leaves. mix very well and then season with salt. cover the pan with a rimmed lid and add water on the lid. cook on a low flame. this technique creates steam in the pan and helps in cooking the veggies. in between do check while the methi bhaji is cooking. carefully remove the lid as it is very hot. if the bhaji looks dry then add some more water on the lid. cover and continue to cook. once the potatoes are done, then add 3 tablespoons coconut. if the methi bhaji has lots of liquids or water, then cook it without the lid till the liquids dry up and then add coconut. mix very well and saute for a minute. serve methi bhaji hot or warm with chapatis or phulkas. you can skip adding fresh coconut if you want. skip asafoetida for a gluten free version.